1. As your hive begins to grow, their need for food will grow as well. It takes up to 2 frames of honey to raise 1 frame of brood. Be sure to check your hive at least every other week to ensure they have enough food stores to grow properly. Even if flowers are blooming, that doesn’t mean those flowers are producing enough nectar to sustain your hive. 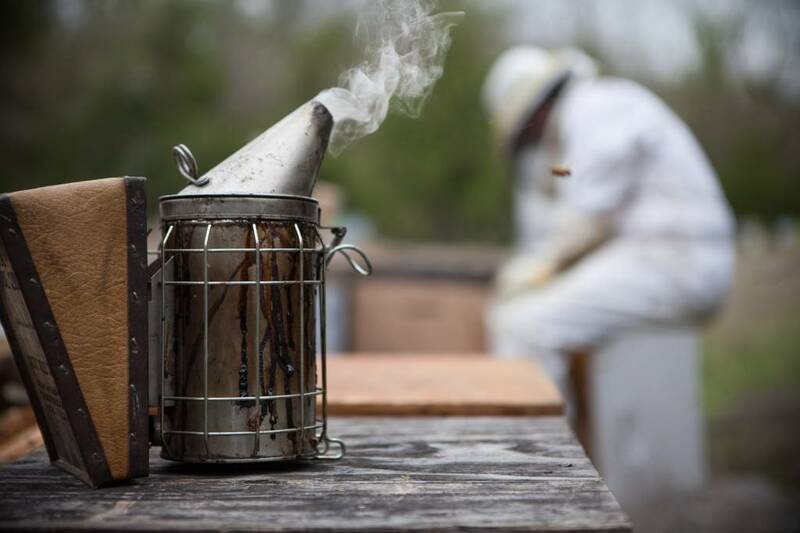 We recommend maintaining at least a 20lb surplus of stored honey or syrup in your hive during February. Feed a 2:1 (2 parts sugar to 1 part water) syrup if your hive has less than a 20lb surplus of stored honey/syrup. We always recommend feeding a 2:1 ratio, as a 1:1 ratio can ferment more quickly. 2. With an increasing number of flowers beginning to bloom, feeding a pollen substitute is not as critical. However, during the months of February & March, we can have unexpected cold weeks. During these weeks the bees are unable to forage. If the weather is 50-55 degrees or below, bees typically forage very little. If there are more than a 2-3 consecutive days below these temperatures, a strong growing hive can run out of stored pollen. If a hive runs out of pollen they will begin cannibalizing brood, which can cause your hive to quickly lose strength. To prevent this, give each hive a pollen patty if these conditions occur. 3. Consider reversing boxes. If your hive has overwintered in 2 boxes, you will often find the majority of your bees are now in the top box as they migrated upward over the winter, consuming honey. If this has happened to your hive, reverse the boxes, placing the box full of bees on the bottom, and the empty box on top. 4. If your hive has all of the boxes currently 75% or more full of bees, add an additional box. Very strong hives can and will swarm in late February, or early March. Prevent swarming by adding an additional box and planning to make a split later in the spring. 5. Consider treating for mites. As a general rule, test for mites before treating. Every hive has mites, but not all hives have high enough levels to necessitate treating. Test using the sugar role test, ether roll test, or sticky board test. A visual inspection IS NOT a reliable method for determining mite levels. In general, if you visually see mites, the infestation is already at lethal levels for your hive. If your hive has more than 2 mites per 100 bees, treat. 6. Order your bees if you are wanting to grow your apiary or your queens if you are planning to split your hives. To ensure that you are able to choose the pickup that works best for your schedule, we strongly encourage you to order your bees and queens now. Great questions! We would recommend moving a few frames of honey down into the bottom box, and yes, feed! This is great info! If you have some brood in the bottom with mostly empty comb (~2 frames in the bottom) and 3-4 up top with the remaining honey, would you recommend reversing the boxes in this situation? And if you only have 2 frames of honey left, it is time to feed, feed, feed, correct?